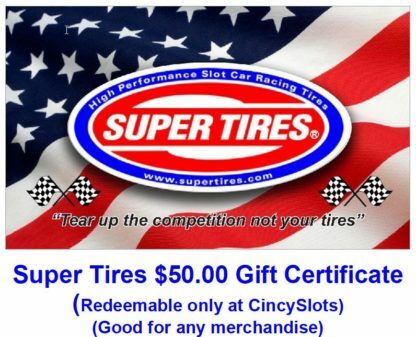 Super Tires is the 2018 Turkey Day Race Sponsor! Nick and Sandy at Super Tires were kind enough to sponsor our 2018 D124 Turkey Day Race next month. We have 18 racers coming in from 4 different states. This is our annual 6hr race held on a 120' Carrera Digital track. They are donating 2 $50 gift certificates. 2 lucky racers will go home $50 slot dollars richer, win or lose. Thank you Nick and Sandy for your generous donation and support. Nick and Sandy are good people.